On Friday 11 May, students in Years 10 and 11 started the school day with a special visit from internationally renowned ministry leader Steve Angrisano. 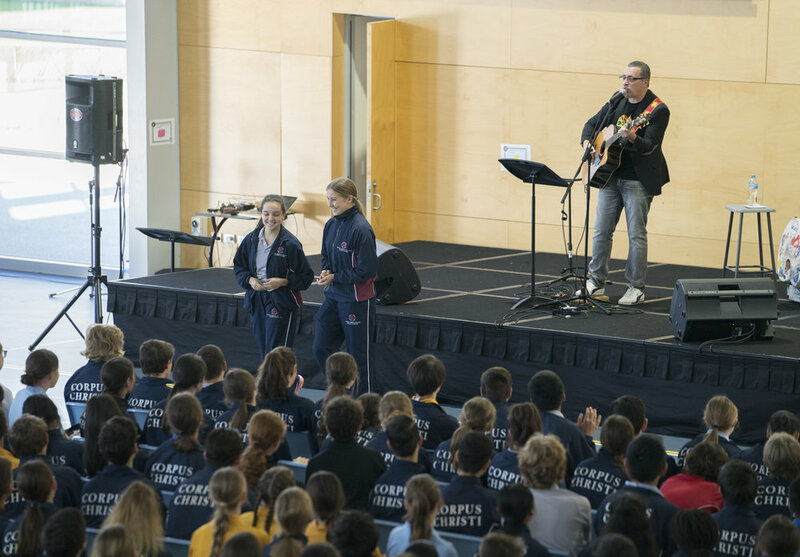 Part of the College’s Year of Youth celebrations, the double-period session commenced with audience participation as Steve engaged the year groups through his unique blend of interactive humour and song. Anyone present in the College gymnasium would be able to speak to the energy and gamesmanship of the Corpus students during these activities, showing a true community spirit and warm welcome for our US-based guest. Steve then began to share his message of hope, faith and love, speaking to students about his experience as a community member at Columbine High School during the time of the 1999 massacre and its aftermath. In an honest and respectful manner, Steve recounted firsthand accounts of the shootings, as described by students he knew, and shared his own experiences in assisting grieving families. Through these stories, Steve highlighted the miracles of faith even in the face of evil and darkness. He reminded us that in this world human beings are unlike any other species, capable of destroying each other in calculating and cruel ways but also capable of incredible love and life-giving presence. By the time Steve invited students to help him sing ‘Stand By Me’, marking the halfway point of the session, he had already prompted the students to consider the power of our faith and our worship. In life, there is both levity and sorrow, peace and crisis. In practising our Catholic faith and following Christ’s teachings, we can empower ourselves and others to even in the most trying of times. Steve’s next story conveyed a dual message of friendship and redemption. Students on a boating activity were quick to exclude a boy with Down Syndrome. It was only when a popular, burly football player volunteered to sail with the boy did the rest of the students stop and take notice, rethinking their treatment of their peer. In leading by example and surprising himself, the football player demonstrated that we are all capable of compassion, change and connection. With the students then including the boy with Down Syndrome in their activities, a self-described ‘mean girl’ took the opportunity to get to know the boy, someone she had easily shunned in the past. In changing her behaviour, she was able to see the boy as a fellow member of the community, a student just like her. We are all created in God’s image and it is never too late for us to learn new lessons and open our hearts to others. Like the song Steve sang to close, we encourage all Corpus students to “Go make a difference”. The College sincerely thanks Steve for visiting the College, and we look forward to continuing to celebrate the Year of Youth throughout 2018.